The vulnerable Pisces, in union with the timid Goat, not only retain their inherent sensitivity, but also multiply it several times. People of this combination of characters are distinguished by their calm, reserved character. They do not seek to change the world: they accumulate energy in themselves, and do not transmit it outside. According to the combined horoscope, Pisces-Goat is a subtle, creatively gifted nature, but at the same time a practical and integral personality. In this combination, you can find anything: emotionality and sober pragmatism, prudence and unpredictability. Thin mental organization does not prevent the Pisces-Goats from taking a serious, thoughtful approach to life. Often these people look older than their years, hold on simply, but with great dignity. It seems to others that they know all the secrets of the world. Impressive Goat-Pisces require positive emotions, and stressful situations have a bad effect on their mental health. Of course, they will not tear and toss, trying to express their discontent as loudly as possible. Most likely, they will linger and try to wait out the negative moment. Still, Goat-Pisces does not seek to gain a reputation as a fiery fighter, they like the quiet and calm atmosphere. In difficult moments, they will be happy to support friends, although they do not ask for help, but they appreciate any attention gestures. These people know how to be grateful, they always pay back debts, and they are more than repaying for a good attitude. The Goat-Pisces are loyal and reliable friends, ready for the sake of their comrades for any sacrifice. The main feature of the Pisces-Goat sign is emotional sensitivity and responsiveness. Let him be distinguished by increased vulnerability, impressionability, but never remain indifferent to other people’s suffering. It instantly gains strength and confidence as soon as it encounters evil and injustice. Goat-Pisces is so kind and trusting that they often become victims of dishonorable people. However, they remain true to their convictions: truth and good will certainly prevail. Friendship and human relations are valued above all, and not material wealth. Thanks to their intuition, the Goat-Pisces keenly feel the danger, they know how to circumvent difficulties and problems. However, they will not be cautious and take care of themselves if it comes to helping loved ones. Charming Goat-Pisces can make a good impression. They behave in accordance with the expectations of society: impeccable manners, tact and politeness — nothing superfluous, annoying and provoking protest. At the same time they keep their secrets reliably, they are not trying very hard to find mutual understanding with others. Goats-Pisces can be capricious, unpredictable people who are not aware of their actions. They obediently follow their fate, believe in everything mystical, adore riddles and secrets. All their actions, even the most absurd, obey a certain logic. Do not underestimate the inner potential of the Pisces-Goats, they know how to achieve their goals. Although, perhaps, too much fuss and worry about small things, but still bring their plans to the end. It’s hard to imagine a more romantic person than Pisces-Goat. Even a strong passion will not make him be impatient and rude. He tries to achieve reciprocity by beautiful courtship, not by force. According to the love horoscope, Pisces-Goat is an attentive, responsive partner, sensitive to the mood of his half. Poor tolerates loneliness, seeking a stable relationship. He has a big and kind heart, he tries in every way to please his beloved or beloved. For the Pisces-Goat, the family is the greatest value in life: worships its loved ones, faithfully serves them. Entering into a marriage, forgets about all his hobbies. Friends can take offense to him as much as he wants, but he is of little interest in noisy companies. Goat-Pisces spends all his free time at home with his family. This is a loving and caring parent, always ready to help and support, even to the detriment of their interests. However, sometimes it is capricious and demanding, in this case, relatives should resort to compliments and declarations of love — Goat-Pisces will not stand. These people show amazing interest and responsibility in any business. Pisces-Goats are able to reach great heights in their careers, but they do not strive for this at all. They do not like to overcome difficulties and obstacles, they are always ready to compromise. They are able to give the right advice, intuitively determine the best course of events. Pisces-Goats make good assistants and advisers, but leaders are not the best. These fussy, gullible, gentle people are not capable of decisive action. Kind-hearted and responsive Pisces-Goats are most often chosen by professions associated with communicating with people. They see their vocation in helping others, in every way trying to alleviate the suffering of people. They love to teach and teach, each of the Pisces-Goats can easily become a highly qualified teacher or psychologist. No less in demand in any creative profession: an artist, actor, musician, designer, director, writer. Among such dreamy Goats-Pisces there are many successful businessmen and talented inventors: they are able to bring any idea to life, once they want it. Calm, peace-loving Pisces-Goats men are pleasant in communication, people like their softness, courtesy. They are sincerely interested in the problems of friends, they are trying to help. These are surprisingly kindhearted, sympathetic men, but unadapted to life. It is easier for them to yield and obey the majority’s opinion than to achieve their own. The desperate Goat-Pisces are capable of aggressive behavior although. Strong intuition people clearly understand when it is worth getting involved in the fight, and when it’s better to step aside. In a romantic relationship, first of all, they seek for warmth, not sensual pleasures. They keep their fidelity to their spouse, they do not look for connections on the side. Credulous Pisces-Goats women are touching in their defenselessness, men want to save them from all the hardships of the world. However, they have enough willpower to be able to solve their problems, just too much energy is spent on experiences. Natural intuition allows them to avoid serious problems and troubles. 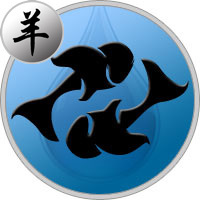 Therefore, the women of Pisces-Goat sign live a rather happy life, filled with pleasant events. Nature has generously endowed them with talents, most often choose creative professions, where they can unhesitatingly throw out all their emotions and feelings. Women of this sign combination are aimed at the family, they do not need personal freedom. With great pleasure they take care of their husbands and children, they feel comfortable and confident in their home.